Do you recall the story I broke last month about Samsung buying Liquavista? Well, today Samsung officially announced the opening of their new R&D Center in the Netherlands which will be focused on the work already started by Liquavista. 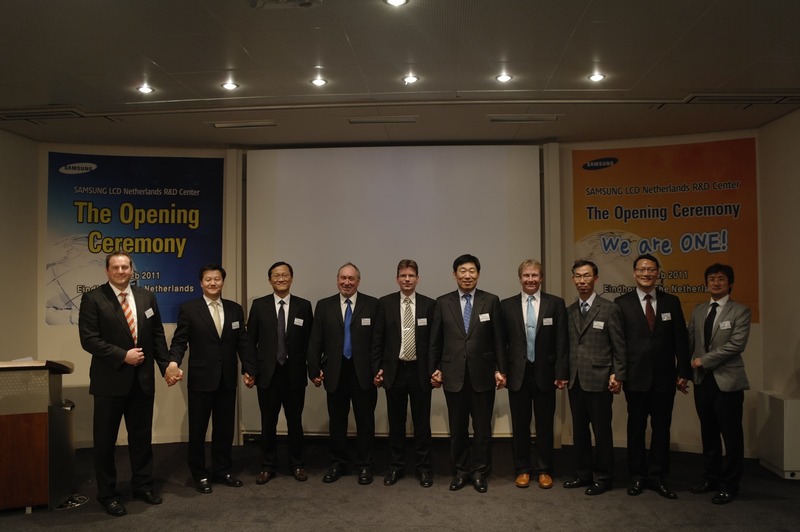 On February 15, 2011, Samsung Electronics Co., Ltd. held the opening ceremony of the Samsung LCD Netherlands R&D Center (SNRC) to strengthen its technology portfolio for the next generation display and its R&D capability in Europe. SNRC, as Samsung's European display R&D center, will focus on developing future display technology including Electrowetting Displays (EWD). Over 60 executives and staff members of Samsung Electronics and SNRC attended the opening ceremony, including the president of LCD Business Wonkie Chang (5th from right), CEO of SNRC Johan Feenstra (6th from right) and the senior vice president of the LCD Business Jootae Moon (3rd from right). I've learned from my contact with Liquavista (now SNRC) that the sale wasn't supposed to have been announced until the formal launch today. They were a little put out and flabbergasted when I broke the story (I love doing that).